The matchwinner Mundy had a significant game for Fremantle, winning 29 possessions (11 contested), nine kicks, 19 handballs, three marks, six clearances, six tackles and registering seven score involvements. 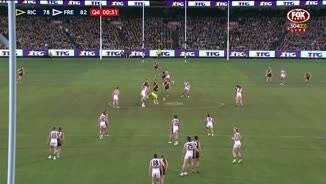 Fremantle has stolen victory in the final minute with a goal to Mundy from a set shot from just outside the 50 metre arc, the only goal from this distance for the match. With the goal to Mundy, Fremantle leads for the first time since the 20minute-mark of the second term. Fremantle has only led for 8 minutes and 58 seconds of the game. Danyle Pearce has kicked the ball out of bounds on the full from long range. He has registered two behinds and two misses from four shots. Although Fremantle has outscored Richmond this quarter, the Dockers have only taken eight marks in 18 minutes. The Tigers have taken 23, including five inside forward 50 this term. From a set shot, Martin has hit the post again. This is the seventh 'poster' for Richmond. The Tigers have kicked 6.2 from inside 30 metres, and 3.11 from outside this range. 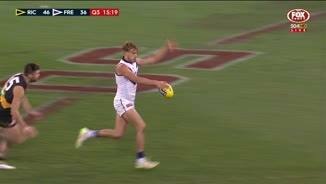 Barlow's goal came directly from the Fremantle kick in, the first from this source for either side in this match. Fremantle has taken the ball inside 50 from a kick in on five of 16 attempts (31 per cent), while Richmond hasn't done so from nine attempts. With that behind to Martin, Richmond has now hit the post with six shots (three to each side). Fremantle has had one scoring shot hit the post. With the first goal of the last term to Lloyd, Richmond has kicked the first goal of every quarter in this match. Fremantle has only trailed at threequarter time once this season but won the match, against Port Adelaide in Round 7. The last time the Dockers were behind at the last break against the Tigers and won was in Round 10 2006. 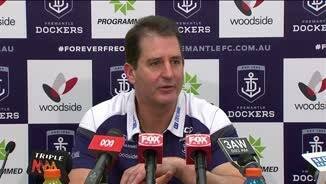 Dockers InterchangeClancee Pearce off due to an injury. Tigers InterchangeNick Vlastuin off due to the blood rule. Tigers InterchangeShaun Hampson off due to an injury. Tigers InterchangeBrandon Ellis off due to an injury. Welcome to MCG for the Richmond v Fremantle Round 17 clash. FREMANTLE star David Mundy booted a clutch 50m goal in the final minute to lift the Dockers to a gripping four-point win over an inaccurate Richmond at the MCG on Saturday, exacting some revenge on the Tigers for a home loss earlier this season. In a battle between two sides expected to feature deep into September, the Dockers snuck over the line 12.10 (82) to 10.18 (78) despite trailing for most of the match. A horror kick-in by Bachar Houli in the dying stages – after Tommy Sheridan's long-range miss – went long and straight down the centre corridor towards outnumbered teammate Kane Lambert. Garrick Ibbotson took the intercept mark and hit Mundy with a pass 45m out directly in front. Mundy had ice running through his veins as he lined up a set shot and, with the clock counting down towards the final 30 seconds, split the middle. His goal put the Dockers ahead for the first time since midway through the second quarter. 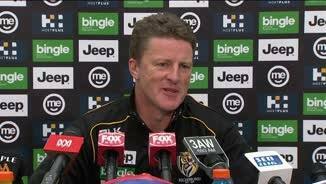 Speaking post-match, Richmond coach Damien Hardwick refused to blame Houli for the loss, instead pointing to the Tigers' wastefulness. "It's easy to focus on the last mistake of the day, but our game was littered with mistakes," Hardwick said. "As harsh as it was … we had more than ample opportunities to win the game and we didn’t." Freo desperately held on for their 14th win for the season, maintaining their stranglehold on top spot – two wins clear of Hawthorn - and Ross Lyon's men remain on track for a top-two finish for the first time in club history. But Lyon was realistic that his side still has areas for improvement. "[I] compliment their players on their effort but not their method," he said. "The reason we were under pressure was some horrendous ball use. At times it was their pressure but our ball use was just bottom end, really poor." 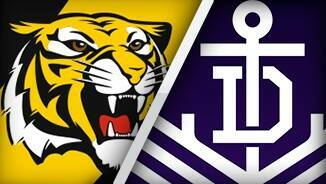 The Tigers will be kicking themselves for coughing up a gilt-edged opportunity to close the gap on the top four. They led by 12 points early in the final term, but missed shots late by skipper Trent Cotchin and Jack Riewoldt came back to bite. Hardwick's men will now be at least a game behind the top four after round 17, but could fall two wins off the pace if the Sydney Swans upset West Coast in Perth on Sunday. Either way, it was a missed opportunity to secure a top-four berth for the first time since 2001 – the year the Tigers last won a final. From two goals down in the last term, the Dockers did as they had all match by fighting back with a controversial free kick and goal to Pavlich, followed by a soccered major from Michael Barlow which reduced the margin to just a point at the eight-minute mark. When Tigers youngster Ben Lennon showed nerves of steel to boot his second major at the 11-minute mark the Tigers re-opened the edge they held for most of the match. But the Dockers kept on coming, with Mundy (28 disposals) capping an outstanding game, while other big-bodied midfielders Michael Barlow and Nat Fyfe also willed Freo home. Skipper Matthew Pavlich (three goals) recaptured some of his best form, while Stephen Hill never stopped running. Brandon Ellis (31) was tireless for Richmond, while 200-gamer Troy Chaplin (23) and Cotchin (24) were influential. When the teams met in round nine, the Tigers blew the Dockers away with an eight-goal first quarter. 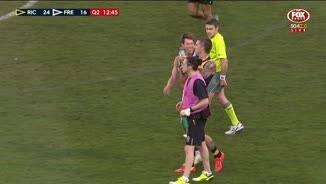 But Ross Lyon's men refused to let Richmond off the leash in the rematch. Scores were level at quarter-time, with the Tigers failing to capitalise after having the better of the opening stages. The contest opened up somewhat in the second stanza, with Richmond breaking away to a game-high 13-point lead through Kamdyn McIntosh and Ivan Maric. 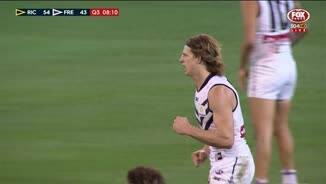 But Pavlich again bobbed up with a soccered goal, Chris Mayne was gifted a 50m penalty against Dustin Martin for spraying water and Hayden Crozier banged through the Dockers' fifth from a free kick to put his side in front. 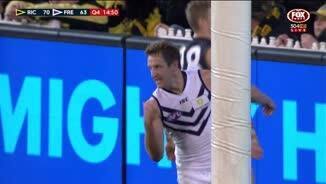 Freo started to take full toll from giant ruckman Aaron Sandilands' centre hit-outs, but the lead changed hands for the third time for the quarter when Maric banged through his second. It stemmed the Dockers' momentum only momentarily, with Matt Taberner leaping high to mark on his chest and kick a team-lifting goal on the half-time siren as Freo went into the rooms down by just two points. Richmond lost Shaun Hampson to an ankle injury after half-time, with the ruckman subbed out of the match, which allowed Sandilands to get on top in the middle to help ignite the Dockers' come-from-behind victory.